When it comes to digital marketing, many companies are hesitant to put some of their budget toward online advertising. Whether they think it’s a waste of money or just aren’t sure about the returns, they will often avoid advertising online in favor of other inbound marketing strategies. Though inbound marketing is vital to reaching, growing, and engaging your online audience, it’s important not to overlook the benefits of online ads. For every $1 spent on Google Ads, businesses make an average of $2 in revenue. If return on investment is a major concern you have when it comes to advertising online, then this is one of the digital marketing statistics that should put you at ease. Google Ads, or PPC ads delivered through the Google search engine, have the potential to generate some serious revenue for your business. Companies typically make about double their investment when advertising on this platform. 64% of consumers will click on a Google ad when they are looking to buy items online. While search engine optimization takes time to work its magic, PPC ads provide instant results. This statistic shows that most customers who are ready to buy will click on your Google Ads. The suggestion here is that Google ads work for helping you attract qualified leads who are lower in the marketing funnel. This provides faster results, allowing you to increase conversions when you include Google ads as part of your online marketing strategy. Social media and watching video content are the two most popular online activities. According to Smart Insights, engaging on social media and watching videos online are two of the most common activities for individuals who use the Internet. This is great news for those who want to advertise online. By incorporating social media ads and video ad content into your online advertising strategy, you can reach a larger audience, getting more out of your ad budget. 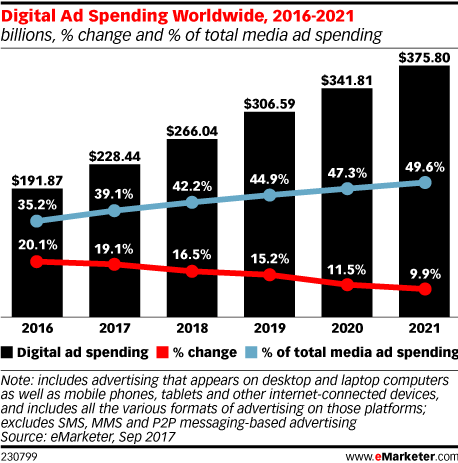 Worldwide digital ad spend is predicted to reach over $375 billion by 2021. With experts predicting that spending on digital ads and media across the world will be approximately $375.80 billion in just a few year – it’s clear to see that online advertising has become a popular way for brands to reach and engage their audience. This is also a clear indication that if you want to remain competitive, you’ll need to start advertising online as well. With digital marketing statistics like this, there’s a good chance that your competitors are already making it a priority. If you aren’t already using video as part of your online advertising strategy, than you could be missing out on a powerful opportunity to convert. Videos tend to be more eye-catching and engaging, which means that many consumers are more willing to take an action on a video than other types of ads. By adding video advertising to your online ad strategy, you can work to boost conversion rates and drive more sales. Location-specific digital ad campaigns are 20x more effective than traditional banner ads that are not location-based. According to Businesswire, location-based online ads are significantly more effective than banner ads that don’t take location into account. Today’s consumers want their ads to be relevant and personalized. And this includes seeing content that’s related to their location. Using location-based online ads can help you improve conversions by bringing more qualified traffic to your site and physical store location. 70% of advertisers plan to increase their budget for mobile social advertising. Not only are your competitors probably already using online ads to reach and engage their target audience, but digital marketing statistics suggest that they don’t plan on stopping any time soon. As your competitors increase their mobile social digital ads budget, it will be important for your business to reevaluate your own social media advertising budget to see if you are getting enough out of your ads. Over 51% of smartphone users have found new brands or products while searching from their mobile device. Studies from Google show that over half of those who use smartphones are utilizing these devices to find new brands and products. This is just one of many digital marketing statistics that show the importance of including mobile ads as part of your online advertising strategy. Mobile ads help your brand take advantage of those “micro moments” when consumers are ready to discover new products or look for businesses to buy from. When you combine video with full-page ads, you can boost engagement by 22%. Purely text-based ads just aren’t enough to capture your target audience’s attention. If you want to boost online ad engagement rates, combine your full-page ad text with a video. Video content can help your audience better understand what you are trying to communicate. Not to mention, consumers tend to retain more information when they watch a video vs. just reading text. Only 7% of search engine users will ever make it to the third page of the search engine results. With less than 10% of search engine users making it to the third page of the search engine results, it’s pretty clear that if you’re not in the top few search results, you may not get the opportunity to reach and engage your audience. PPC ads are a great way to complement your organic SEO results by enabling your company to appear at the top of the search engine results page. If you need help getting started with PPC ads, you may want to partner with a Google Ads agency. 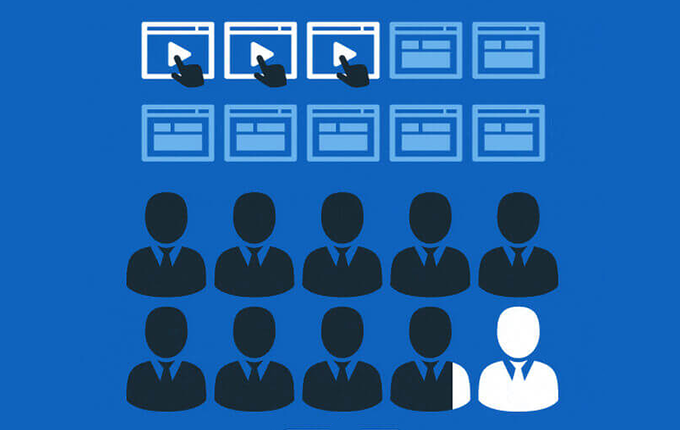 Online video ads are a great way to break through the noise of the busy online marketplace. This type of content tends to be more memorable because most consumers can retain more information from a video than they can from text. If you have something important that you need to get across to your audience and you want them to remember, try using a video to promote it. The average smartphone conversion rate is up by 64%. If none of the other digital marketing statistics convince you to include mobile ads as part of your strategy, this one certainly should. Not only do smartphone users convert on their mobile devices, but their conversion rates are steadily increasing. No matter what type of business you have, it’s imperative that your ads are mobile responsive. And that you include specific mobile ad campaigns aimed at reaching and converting these users. 37% of online shoppers report using social media for inspiration when they’re ready to make a purchase. Over one-third of online shoppers are using social media for more than just connecting with friends and family. They’re using it to look for purchase inspiration. This percentage is higher than many of the other forms of online media that they’re using to help make a purchasing decision. It’s a good sign that brands that advertise on social media have the opportunity to reach more consumers who are ready to buy and maybe even influence their purchasing decision. Ecommerce sellers that use product videos can increase product purchases by 144%. This is one of the digital marketing statistics that makes it clear how much ecommerce brands need to use video to sell their products online. But why do product videos increase conversion rates? It could be that consumers prefer video content or even that product information is easier to understand when it’s laid out in a video format. Either way, it’s imperative that you use video to explain the benefits of your products. 64% of online consumers have reported that watching a Facebook video has influenced them to make a purchase. Every business is looking for ways to influence their audience’s purchasing decisions. What is made clear from this and many other digital marketing statistics is that both video and social media play a significant role in reaching and engaging your target audience – no matter who they are. For best results, combine the two by creating attractive and engaging video content just for Facebook. Video ad completion rates have shown a steady increase over the past few years, reaching 70% just last year. In 2017, overall video ad completion rates reached a steady 70%, up from 47% in 2015. The reason for this is most likely that more and more marketers are becoming experienced with video ads. They’re finding ways to ensure that they retain the viewer’s attention while encouraging them to act on the information presented. To improve your video completion rates, keep your video ads short and useful with engaging written and visual content. 73% of consumers don’t like pop-up ads. Many different studies and digital marketing statistics have shown that consumers just don’t respond to pop-up ads. They are highly disruptive, which can become frustrating for consumers who are trying to concentrate on other things. What does this mean for your business? Ditch the pop-ups in favor of more effective and engaging online ad content like social media ads or native video content. About 3.03 billion people across the globe are active on social media. 72% of consumers want brands to share discounts and other promotions on social media. This is good news for both your social media advertising strategy and your organic social media content. If you want to give your target audience the type of content they want, why not share your upcoming promotions and sales? Throw a coupon in there every once in awhile to keep your fans and followers happy. On average, 1.57 billion YouTube users will watch about 5 billion videos every day. So many digital marketing statistics point to the importance of video content. But the sheer number of users and how many videos they watch is truly a testament to the power of video as a digital marketing medium. If you aren’t already creating online video ads and organic video content, it’s time to start including this as part of your digital marketing strategy. Nearly 60% of marketers think that influencer marketing will become increasingly more important to their marketing activities in the next 3 years. Though it may not be right for every brand, influencer marketing has become a very popular way to reach and engage new audiences that may be a good fit for a brand’s product or service offering. And many marketers are finding this form of online advertising to be effective. So much so that 57% of them predict they’ll integrate influencers into all of their marketing activities in the next few years. Facebook advertising spend is expected to reach $25.56 billion by next year. This is one of the digital marketing statistics that probably isn’t too hard to believe. As one of the most popular social media platforms in the world, Facebook has a lot of engaged users who regularly visit and engage. So it should come as no surprise that Facebook advertising spend is predicted to reach $25.56 billion by 2019. As Facebook continues to make improvements to its ad platform, businesses will be able to enjoy even more benefits in the future. On average, each person online is served about 1,700 banner ads each month but only view half of them. This may seem like one of the most surprising digital marketing statistics, but it can have significant impacts on your business if you’re using banner ads to reach out. Review your online ad strategy and be sure to carefully track performance to ensure that you’re maximizing your online ad spend. If you find that banner ads just aren’t cutting it, look for alternative ways to reach and engage your customers online. More than 70% of marketers will fail to use behavioral data for online ad targeting. Are you using behavioral data for your online ad targeting? Behavioral data helps you better understand your customers and create more tailored online ad campaigns. If you want to reach a more specific segment of your target market or customer population, take a look at what their online behaviors say about them. When it comes to PPC ad campaigns, about 4 out of 5 businesses focus on Google Ads. With the popularity of the Google search engine, it should come as no surprise that the majority of businesses are using the Google Ads platform for their PPC campaigns. If your competitors use PPC ads as part of their online marketing strategy, there’s a good chance that their focus is on Google as well. What does this mean for your business? You may want to consider investing more of your PPC budget into Google Ads. For the average Internet user, social media takes up 33% of the time they spend online. Effective digital marketing requires that you meet your customers where they are. Since Internet users spend on average one-third of their time online on social media channels, it’s vital that businesses include social media ads as part of their online advertising strategy. Product Listing Ads (PLAs) on Google accounted for 52% of retail search ad clicks in 2017. Are you using Product Listing Ads as part of your Google Ads campaigns? If not, you may be missing out on an important opportunity to increase conversions. The percentage of ad clicks that come from PLAs continue to increase each year at a much faster rate than text ads. Consider incorporating this ad type into your online advertising strategy. Website visitors that come from PPC ads are more likely to buy than those who come from organic search. The reason that PPC ads typically have higher conversion rates is because people who click on these ads are often further along in their buyer’s journey. While visitors from organic search may be in the research phase of the buying process, those who click on ads are typically ready to make a purchase. Though organic content is important for helping you bring in new leads and guide them through the marketing funnel, you may also want to supplement your organic digital marketing efforts with paid ads that provide quick conversions. 52% of online shoppers who click on a PPC ad will follow up with a call to the business. As we discussed previously, consumers who engage with PPC ads are typically further along in the marketing funnel. This means that they are either ready to purchase or close to making a purchasing decision. That’s why more than half of online shoppers who engage with a PPC ad are likely to call a business. They either need more information or they’re ready to buy. PPC ads can boost brand awareness by up to 46%. Of all the digital marketing statistics above, none have yet touched on one of the most important parts of engaging consumers earlier in the buying process – building brand awareness. When your PPC ads appear at the top of the Google search engine results page, you are working to build brand awareness. Even if the consumer doesn’t click on the ad, they still see your brand name, can read your messaging, and become familiar with your company. The majority of consumers will identify native advertising as an article instead of an ad. In today’s busy digital marketplace, some consumers have become distrustful of ads or even blind to them. That’s where native advertising can help. By publishing ad content that reads more like an article or piece of content within the consumer’s typical feed, you can help capture some of those consumers who don’t enjoy ads. Amazon is now the third-largest digital ad seller in the United States. According to eMarketer, Amazon is now the third-largest digital ad seller in the U.S. Amazon is predicted to bring in $4.61 billion from digital ads in 2018. Though it is still trailing behind Google and Facebook in terms of total ad spend, this upward trend suggests that Amazon may be a big contender for online advertising in the next few years. Facebook remains the most popular social media platform for both B2B and B2C marketing. If your company isn’t on Facebook, it’s time to get with the program. Facebook remains one of the most popular social media platforms for both B2B and B2C brands. Not only does the platform boast millions of active users, but it also offers a sophisticated ad platform that allows you to target the consumers you want to reach most. 80% of marketers use location targeting for their mobile ad content. Want to reach customers where they are? Geo-targeted mobile ads are one of the best ways to do this. You can serve specific and relevant promotions to nearby consumers who are most likely to be interested in your product, service, or brand. If you haven’t already, consider making location targeting a part of your mobile ad strategy. Marketers who invest more than 10% of their marketing budgets on measurement are 3x more likely to beat sales targets by 25%+. It’s important to remember that online advertising success goes beyond just taking your ads live. Digital marketing statistics consistently show that those who monitor their online ad campaigns and adjust as necessary are more likely to reach or surpass their sales target. Make sure that you have a measurement plan in place and invest in the right tools to track your progress and identify areas of improvement. If you weren’t already convinced of the power of online advertising, then the digital marketing statistics above should help sway you. When you’re finally ready to start creating online ads of your own, we’ll be here to help. We’ve helped hundreds of businesses grow through digital marketing. Contact us today to learn more about how we can help you increase traffic and your bottom line through online advertising.